OK slackers, I know you depend on these games to keep you entertained so I’m doing my best here. Sadly, parenting obligations and increased activity at work have stemmed the tide of posts from your fearless blogger. Take heart! Your game awaits. Cute Planet Puzzle is, um, a cute variation on a classic puzzle standby. Use the arrow keys to guide your little man around the screen and push gems of the same color together. This makes them disappear and magically tansports you back to the stage select screen. 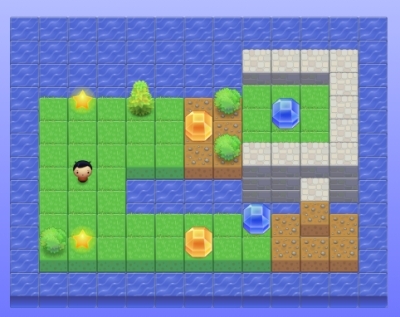 The first several stages are effectively your walkthrough so I’ll stop explaining and let you get to the playing. Enjoy!